We had such a great time at the Southern-Fried Gameroom Expo, we’re back a little bit early with another great interview. 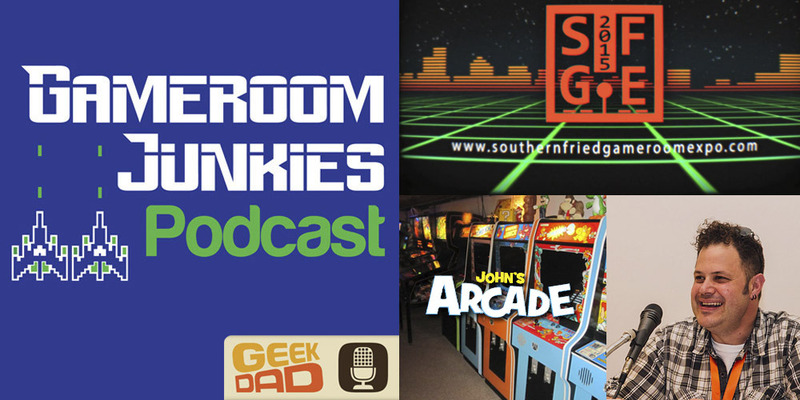 The bulk of this episode is an interview we recorded live at SFGE with long time arcade collector and YouTube celebrity John Jacobsen. John is the host of John’s Arcade, a popular YouTube channel featuring arcade game restoration, how-to guides, collecting adventures, gameplay tips, and more! In addition to his video series, John is co-host of Video Game Outsiders, Arcade Outsiders, and part of the band The Kill Screens. Before the interview, your hosts Patrick and Preston talk a bit about the new reality TV show sizzle reel, Pinballers, and whether it’s a good fit for pinball. Sticking with the pinball topic, Patrick goes into detail about his new pickup of a PinSound circuit board to bring his Star Wars pinball machine out of the disco era. Finally, Preston details some of his new gameroom additions including his late-to-the-party Wii U acquisition and newly-constructed LED-lit shelf for collectibles.